The Business Development Programme provides money and support to help young people. 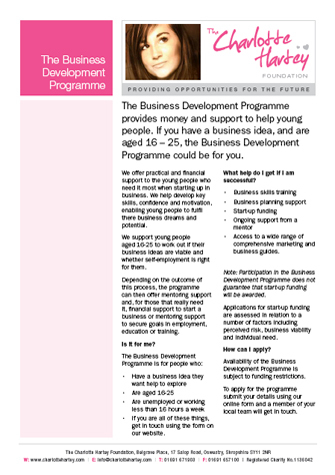 If you have a business idea, and are aged 16 – 25, the Business Development Programme could be for you. We offer practical and financial support to the young people who need it most when starting up in business. We help develop key skills, confidence and motivation, enabling young people to fulfil there business dreams and potential. We support young people aged 16-25 to work out if their business ideas are viable and whether self-employment is right for them. Depending on the outcome of this process, the programme can then offer financial support to start a business or secure goals in employment, education or training. Applications for start-up funding are assessed in relation to a number of factors including perceived risk, business viability and individual need. How to apply for a Business Development Grant?